"Yellow robe; There are mixed prompts, with ripeness a theme, on the nose: honey, dried fruits, white grapes, Canteloupe melon, glazed brown sugar. The palate is also burnished, rich, has a sultry, thick textured being. Aniseed towards the finish helps to lift it. It is very much a table wine, fat and firm, a little doré. There are ginger, flan notes towards the finish. This is sturdy, southern-leaning wine. “The 80% Marsanne gives it white peach, floral traits,” Jean Gonon. Decanting advised. From 2020. 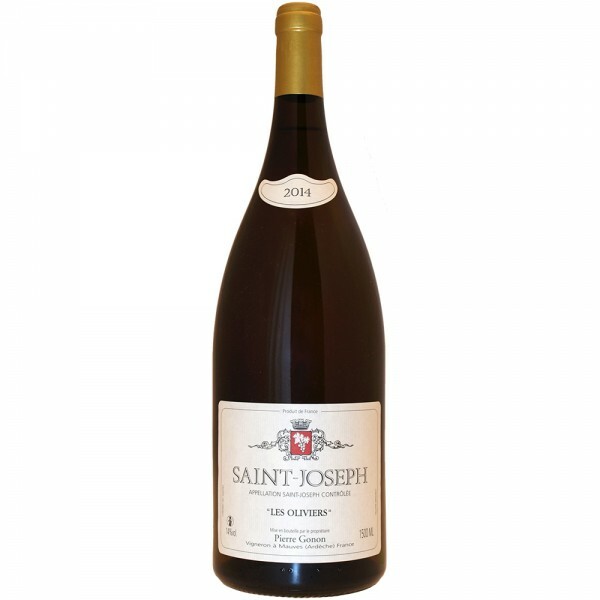 2031-33"
Zitat J. Livingstone-Learmonth: " An STGT (Soil to Glass Transfer) domaine par excellence, and fantastic value and consistency - these red Saint-Josephs are top notch Syrahs. The Vieilles Vignes red, occasionally produced in small quantities, is exceptional. The Gonon brothers, true countrymen and taught by their father, make delightful, delicious wines of genuine pedigree. There is a sensible transfer of fruit from mature vineyards to the cellar, where methods are calm and watchful. No new oak in sight. The white is a high-class example of Marsanne, laced with a little Roussanne from a top, south-facing vineyard, Les Oliviers. Both red and white can evolve well over 20 years in the good vintages."